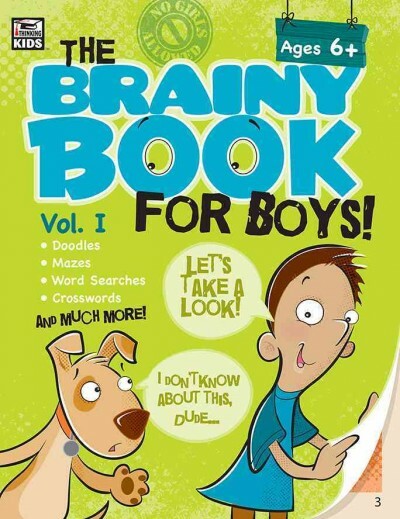 Annotation: No boredom allowed with the new Thinking Kids(TM) Brainy Book for Boys for ages six and up! Encourage critical thinking, creativity, and concentration with this jam-packed 192-page activity book. Every delightfully illustrated page is designed to blast away the bores and snores from long car rides, rainy days, or any time a boost of fun is needed. These captivating activities and clever puzzles will sharpen skills, without feeling like homework, and provide hours of educational entertainment. The Thinking Kids(TM) Brainy Book series provides activities such as search and find, doodles, mazes, and word searches. These colorful books sharpen observation and concentration skills. Interactive activities such as crosswords, word games, decoding, and list prompts are designed to help your child master critical thinking skills while having fun at the same time.